I decided to look into improving speeds over wifi when remoting to my laptop(trying to play Diablo 3 from RT). I recall before February patch Tuesday that there were some issues with wifi, so I assumed that there would be no problems post patches. 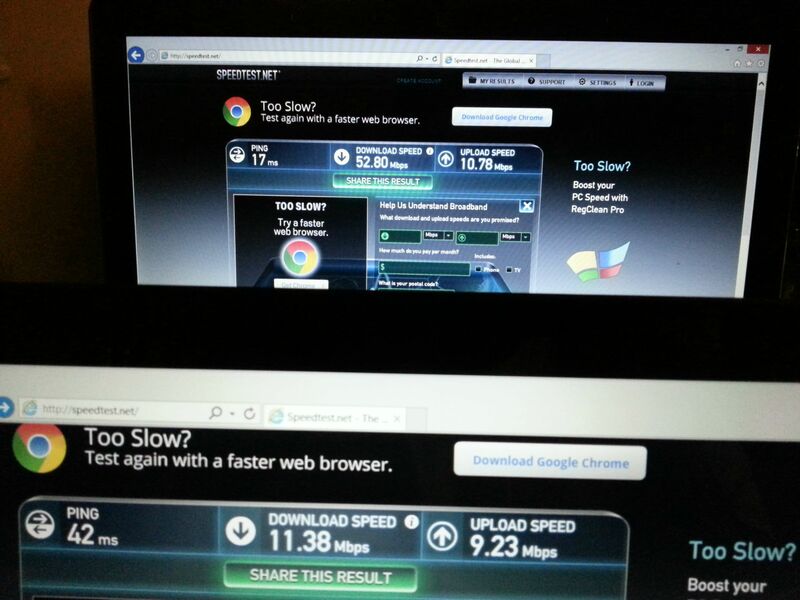 I decide to run some tests over speedtest.net and I noticed this drastic difference. Changed network mode(A/B/G/N). Changed channels/Channel width. Only thing I'm running into issues with is upgrading the firmware on the router(talking to buffalo about it now). Im willing to bet that I am missing/overlooking something simple as **** but I cant seem to figure it out. Any help or direction would be greatly appreciated. Thanks in advance. What does it say your wifi speed rate is under network and sharing? My RT was for some reason maxing out at 65mbps post February patch. But after doing a refresh, its showing 130mbps connected to my linksys N300. My Surface says 130 mbps, but when I run Speedtest, it shows that I'm pulling down 10mbps. I'm not worried about this. You know why? Because speedtest checks your network speeds, not your tablet's network speeds. If you're suppose to be getting higher than 11mbps from your ISP, then you should contact them. Speedtest in no way shows your tablet being slow, just your LAN. True. Im sitting in my room now and I'm getting about 26mbps from speedtest.com even though my wifi speed rate has dropped to 78 mbps. Good morning all. I guess using speedtest.net wasnt the best way to test my personal network speeds. Will check it out when I get home. Loving that avatar @bawboy86. Have not had Bawls since my old PC bang days in high school lol. There were some places where I use to live that sold it at the time. I use to drink it instead of coffee. Now I can't find anywhere that sells it, except online. I may have to start ordering it again. I kind of miss drinking it on a reg. Transfer rates for me on my RT are basically the same as my core i7 laptop. I'm using an Apple Airport Extreme at 5Ghz and connect at 270Mbps with my Surface. There is a lot of wireless interference where I live but I still average about 5MB/s when I do network file transfers. Sorry for the late reply. I am averaging about 65Mbps on the surface and 130Mbps on the laptop. That could just be variations in how the wifi cards are handling things though. I run two networks in my apartment. I think I will just dedicate one to N/5Ghz for all N devices and A/B/G for everything else on the other. Will report back findings. Well my router doesnt support 5Ghz N so I am stuck at 2.4Ghz. Putting it on N only seems to have helped a bit though. Do you average or maxout at 65mbps? I was maxing out at 65mbps after the recent Surface updates. So decided to do a refresh and my RT is getting 130mbps now. Average. I've seen 130 a few times but 65 is average. The link speed reported by the OS has little to do with the maximum throughput you can attain over wifi. On a surface RT, due to the hardware and antenna configuration, the best throughput you can attain is in the neighborhood of 60Mbit/sec (+/- 5Mbit) which works out to about 5MB/sec copy speed if you're transferring something via windows file sharing. This is a reasonably typical speed for 802.11n, given the hardware. Resurrecting this OLD thread. On 8.1 preview, I am now hitting high 6/low 7MB/sec copy speeds, which is closer to the upper end of the 2.4ghz speed range. So it looks like they tweaked the drivers a tad.